Denton’s very first band was formed in 1818 and began playing in public for various celebrations. The townspeople, and especially the hatter Joseph Howard, had subscribed generously to the appeal for funds. They were able to buy a set of instruments, music paper and instruction books for a grand total of Â£210.The big drum was duly painted with the title ‘Haughton & Denton Band’. Haughton, however,was at that time, a separate town and the Dentonians, who outnumbered the Haughtonians, objected to this and so the name was eventually changed to ‘Denton & Haughton Band’. It was very popular and played for many years. Up until 1869, it led the Saint Lawrence’s Sunday School Scholars’ Walk at Whitsuntide. But since 1859 it had a rival. This was the Baxendale’s Band, named after their small factory at the top of Taylor Lane. Thomas Baxendale formed a brass band at his works, which was known for a time as Baxendale's Band, but afterwards became the Denton Original Band. The Denton Original Band began its existence in 1859, its promoters recieving the generous support of some of the hat manufacturers and local gentry. The first headquarters were at Baxendale's, at the top of Taylor Lane, but after a short time they were removed to a room behind the Bowling Green Inn. The band has a wonderful record, the crowning triumph coming in London in 1900 when the Denton Band won the thousand guinea cup which was open to Great Britain and the Colonies. There were great rejoicings in Denton when the result of the Crystal Palace contest became known. The magnificent cup was kept at Denton Town Hall and security of 1,000 pounds had to be given for its custody. After this the band ranked with the highest class bands in the country and was in great demand in all parts. During the twentieth century the band maintained its reputation as one of the leading bands of the Manchester district. Unfortunately, following a fire at band room in 1993 the band folded. However, Denton Original band had a second band “Denton “B” Band”. 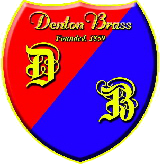 Just prior to this time the “B” band split with the main band and became Crown Point Brass which thanks to the efforts of Mr Roy Prescott and Mr Jack Hansford (conductor) struggled along for another six years keeping the tradition of banding alive in Denton. In 1999 The committee decided to re-form the band under the name Denton Brass which is the current band. Due to the hard work and dedication of the Players, Musical Directors, Committee and the Band’s late Chairman, Mr Peter Gee, Denton Brass has grown from just a handful of players to the band it is today.